This project tested the feasibility of using oyster cages that moved with tidal action to prevent epiphytic fouling on a subtidal oyster farm. Two novel oyster cage designs were tested- one used cylindrical cages that rotated with tidal flow, the other used cages that tipped. These designs were compared to a control which consisted of a conventional float-bag system which needed manually air-drying on a weekly basis. Oyster growth rates, the degree of fouling, and mortality were measured on a monthly basis over the course of the 2016 growing season. The tipping cages exhibited slightly slower growth than the control (51mm vs 55mm shell length), but suffered heavy fouling (particularly from invertebrates) and were difficult to use in the field. The cylindrical cages proved very effective at deterring fouling (with less than 2% of surface area fouled in each reading), but displayed a slower growth rate than the control (45mm shell length). Further refinement of the cylindrical design could provide growers an efficient and inexpensive means of controlling fouling. Outreach was conducted on the Winnegance Oyster Farm website, at the Kennebec Esturary Land Trust’s aquaculture lecture night, and at the Northeast Aquaculture Conference and Exhibition. The removal of epiphytic (fouling) pests is one of the most labor, time, and cost intensive tasks in oyster aquaculture. Current methods of oyster tumbling and cleaning often require specialized motorized equipment that burns gas and is expensive to both procure and maintain. 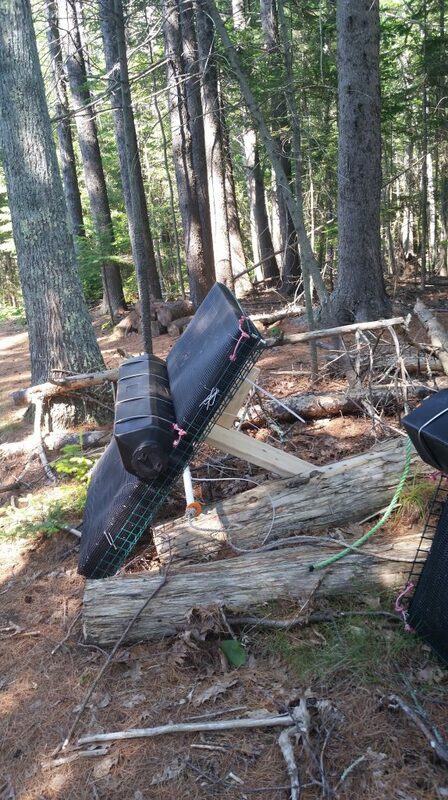 This equipment can be loud- creating conflict with nearby landowners and disturbance of wildlife. The movement of tides presents a potential free-and-green power source for oyster pest-maintenance. 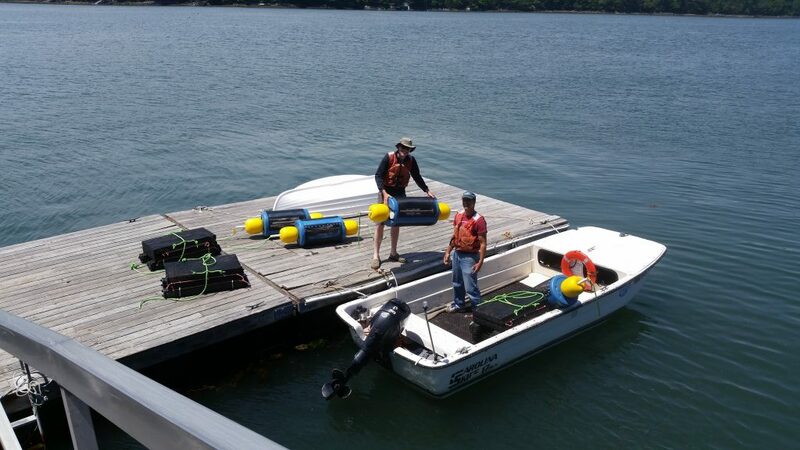 This project tested two new suspended subtidal growth methods that used tidal flux to passively clean and tumble oysters. Oyster growth rates and the degree of fouling were measured on a monthly basis over the course of the 2016 growing season and were compared to a control group grown using a conventional float-bag system. The project was designed and run by Jordan Kramer of Winnegance Oyster Farm- a small intensive sea-farm on the New Meadows River in West Bath, ME. Winnegance Oyster Farm currently has a capacity of 75,000 animals grown on a year to year-and-a-half harvest rotation. Dana Morse of UMaine Cooperative Extension/Seagrant served as a technical advisor to the project, providing input on experimental design/layout and help in the field. UMaine grad student Sean O’Neil performed the project’s fieldwork while the P.I. was sidelined due to an injury. Pemaquid Oyster Company provided a loan of seed-stock to the project. UMaine’s Darling Marine Center served as a field site for the experiment, allowing the research to take place without a loss of leased growing space at Winnegance Oyster Farm. The time-frame of the project was shifted one month late due to back-ordered supplies and an injury suffered in early June by the primary investigator. The full experiment was run, ending in late November. -Conventional oyster cages consisting of two rigid plastic oyster bags suspended by pontoons served as a control treatment. The control treatment cages needed to be manually flipped out of the water on a weekly basis, killing epiphytic pests by exposing them to the air and direct sunlight. After 24 hours, these cages needed to be flipped back into the water. The experimental cages were not designed to need regular manual adjustment. -Experimental cylindrical cages were designed to spin/tumble with tidal action. 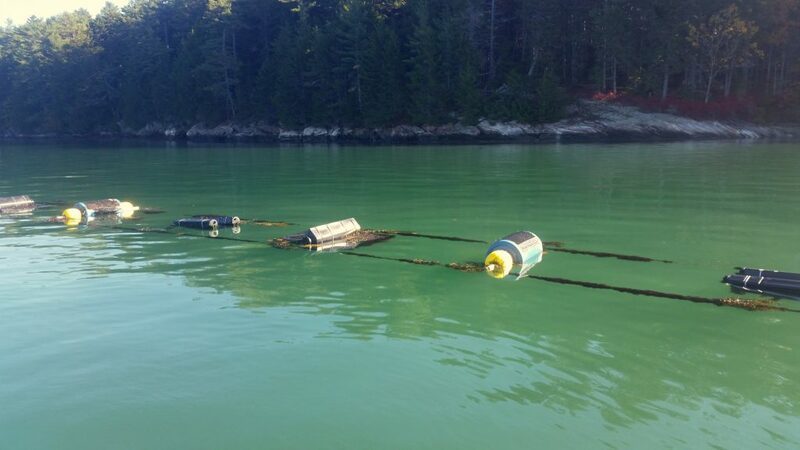 These cages constructed using recycled 20 gallon soda-syrup barrels and large trawl-floats. -A second type of experimental cage was designed to pivot on an axis, periodically exposing oysters to air. 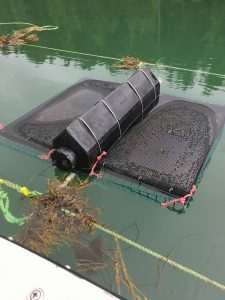 These cages were constructed using aquaculture-floats and plastic-coated wire grating sourced from a lobster trap company. 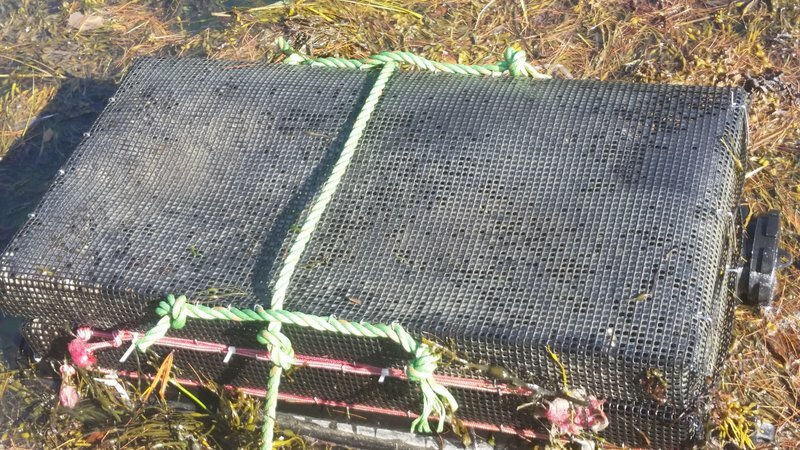 Oyster cages were installed on longlines at the Darling Marine Center’s subtidal aquaculture lease and stocked with oysters in the last week of June and first week of July. The experiment was monitored twice a week (when control cages were flipped). 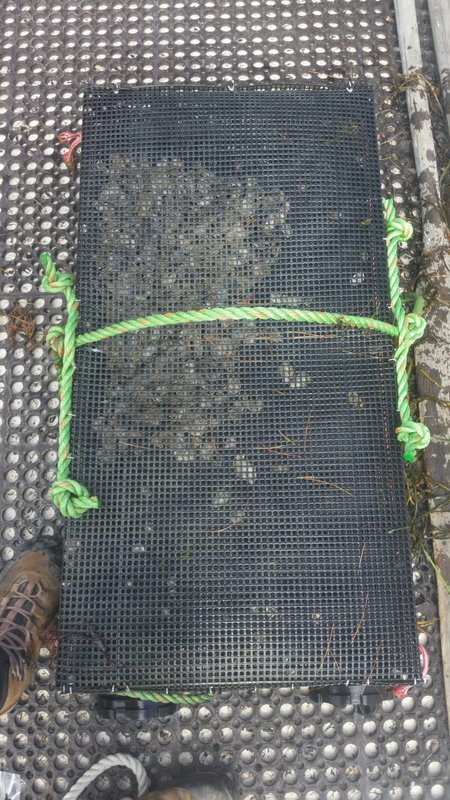 Oyster growth (length, width, and depth), the degree and type of fouling present on each cage, and the mortality seen in each treatment were measured each month- ending in late November. All cages were manually cleaned on a monthly basis, so new fouling could be accurately measured. Digital outreach took place throughout the study on the Winnegance Oyster Farm website. A project overview and preliminary data was presented at the Kennebec Estuary Land Trust’s Aquaculture lecture night. Final data was formally presented on at the Northeast Aquaculture Conference and Exhibition on Jan 16th in Providence, RI. Two experimental oyster cage designs were tested. Both were designed to tumble oysters in-place and periodically expose cages to the air as a means to prevent the growth of epiphytes. A control treatment that used traditional floating oyster bags was tested alongside the experimental designs. Four cages of each type were deployed tested for each treatment. All cages were initially stocked with 2.5 liters of 20mm oysters (appox. 1500 individuals). The first experimental design used buoyant half-submerged cylindrical cages that turned on an axle- reminiscent of a paddlewheel. The cages were designed to turn during the peak flux of each tide- exposing all surfaces to air to prevent the settlement of fouling species. The oysters stayed submerged, but were tumbled and agitated to remove epiphytes. See PDF attachment “Tumbler Cage”. These cages were constructed using common recycled 20 gallon “closed-top” soda-syrup barrels. The ends of the barrels were drilled to accommodate PVC pipe axles (5′ length, 1″ diameter). The axles fit snugly, but were further sealed in place with marine adhesive. Four large cut-outs were removed from the sides of each barrel (using a jigsaw). The edges of theses holes were paralleled with a line of drill holes. These cutouts were covered with standard oyster bag mesh (6mm) and secured with zip ties threaded through the holes in the barrels. The mesh can be swapped out with different sizes as needed. Large (yellow) trawl toggles were inserted over the PVC pipes on either side of the barrels for buoyancy and were secured with longline pins. The cross lines of the longline system were threaded through the PVC pipe. 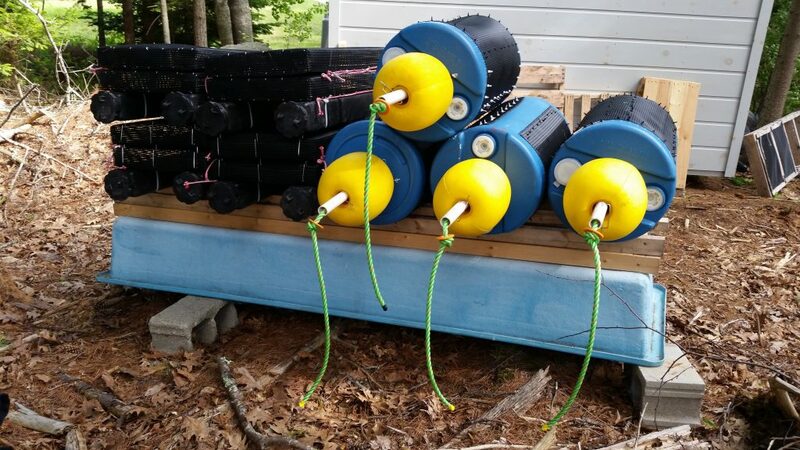 Plastic lobster buoy washers were placed between the ends of the PVC pipe and knots on the cross-lines to prevent rope chafing. 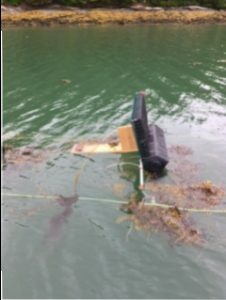 A single barrel cage consisted of a 20 gallon barrel, one 5’x1″ section of PVC pipe, two oyster bags, two trawl-toggles, around 200 zip ties, two plastic washers, two stainless steel longline clips, and marine adhesive. The second design used finned cages attached on a pivot. These cages were designed to pivot as tidal current pushed against their fins, tipping the cage and tumbling the oysters. The downstream side of the cage was designed to lift out of the water by the pivoting action. See PDF attachment “Pivot Cage”. These cages were constructed using a single large HDPE oyster-cage float (sourced from GoDeep). 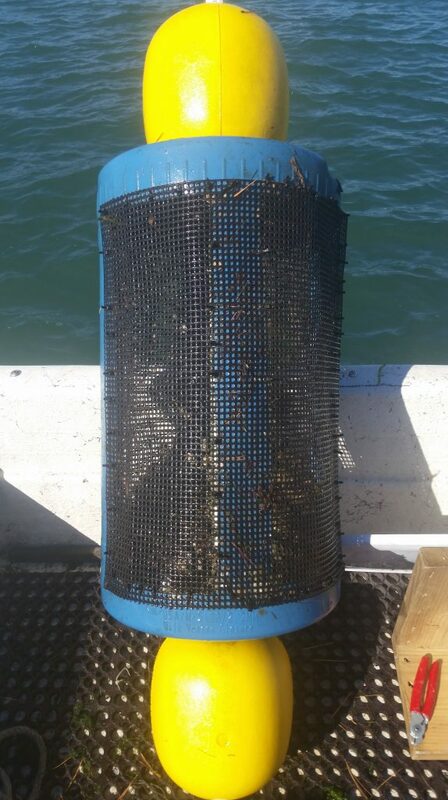 The float was attached to the center of shallow tray constructed of plastic dipped galvanized lobster trap mesh (1″ square) using metal bridles (included with the purchase of floats). A axle of PVC pipe was secured below the float using large “load-rated” zip-ties and marine adhesive. The cross lines of the longline system were threaded through the PVC pipe. 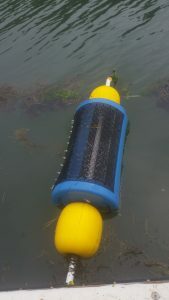 Plastic lobster buoy washers were placed between the ends of the PVC pipe and knots on the cross-lines to prevent rope chafing. 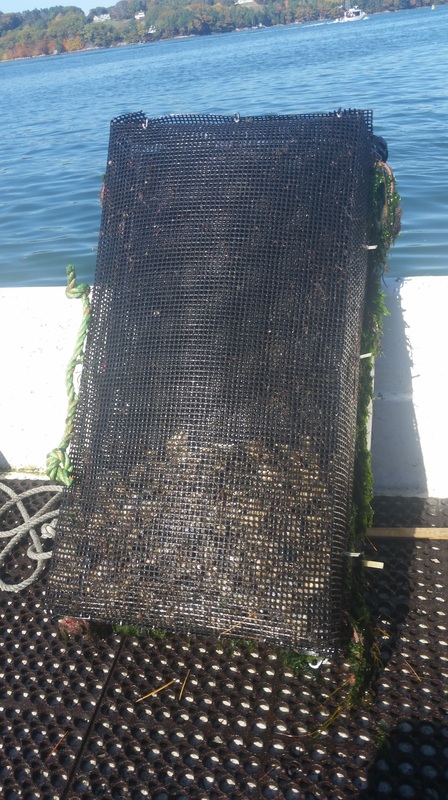 Two standard 6mm oyster bags were secured in each tray using rope and longline pins (for easy removal). A variety of fins were attached to the bottom of these cages with heavy zip ties over the course of the experiment (to attempt to achieve the desired cage behavior). These included buoyant wooden fins constructed of wood and sinking fins constructed of lobster trap mesh covered with heavy plastic (both designs were tried in varying sizes). A single fin design/material was not settled on due to changing cage behavior/balance with oyster growth and degree of fouling. The control treatment cages were manually flipped to air-dry on a weekly basis. Cages were exposed to the air for 24 hours. This practice is in-line with the techniques used on Winnegance Oyster Farm. 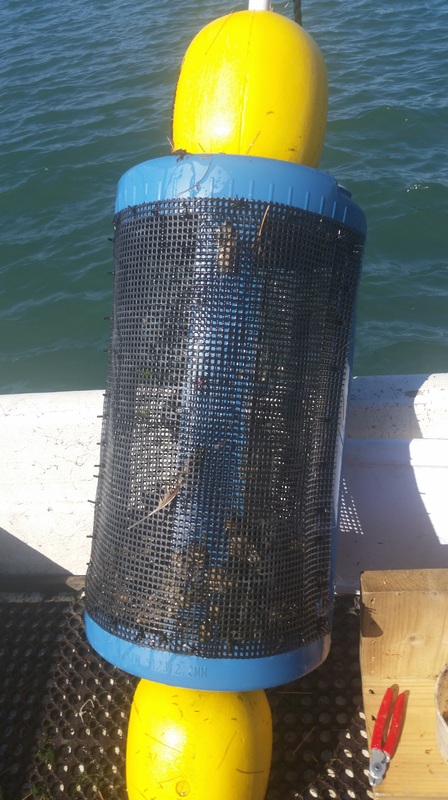 The control cages were constructed of two standard 6mm oyster bags hog-ringed together and fastened to a pair of small oyster cage floats (GoDeep GDOF111C) using large “load-rated” zip-ties (4 per cage). Two small sections of rope were hog-ringed to the bottom of each cage and were used to attach cages to the cross lines. In each scenario, cages were fastened to parallel longlines laterally strengthened with cedar cross-beams and sections of PVC pipe. Longlines were set up parallel to the tidal current and were tensioned with large buoys and chain to keep them taut and properly oriented at all times. The cylindrical/barrel cages remained largely free of fouling through the entire experimental trial. The cages did not spin as expected with tidal flow, but instead turned very slowly in response to wave action. 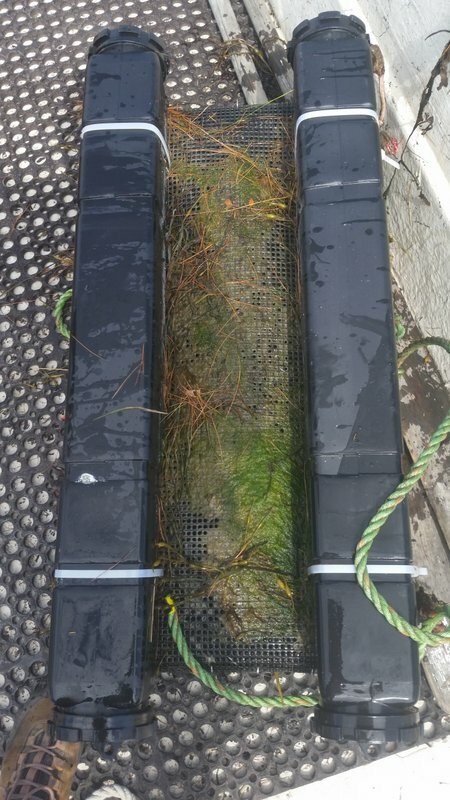 This slow rotation provided ample time for air and sunlight dry the cages, preventing the colonization of both algae and epiphytic invertebrates. The fouling seen in this treatment was minimal (<2% in all readings) and consisted of the filamentous green algae. The pivoting treatment suffered the worst fouling- mostly due to colonization by invertebrates on the underside of the cages (see fouling charts). Balance proved a critical issue. Over-sized fins could throw the cages off-balance, holding half the oysters out of the water with the potential for catastrophic crop loss. Undersized fins didn’t tip the cages far enough to reap the benefit of full air drying, resulting in increased fouling. Even with several adjustments of fin size, buoyancy, and material, the pivot cages tipped less than originally intended. 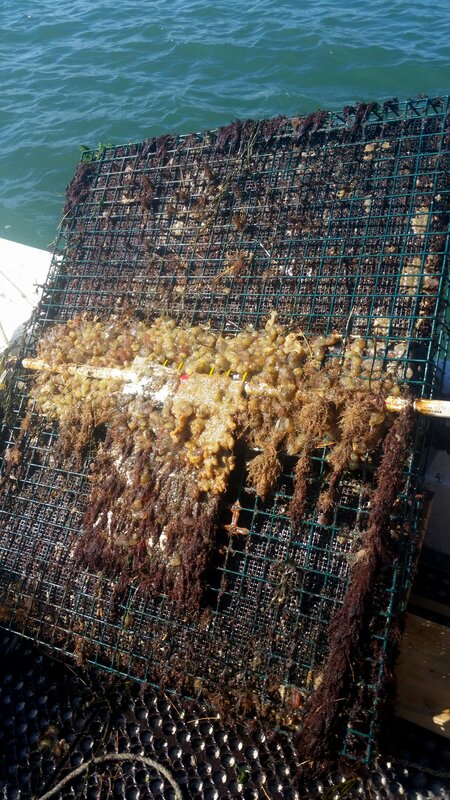 Pivot cages picked up a large variety of fouling organisms (both invertebrates and algae) including several species of green and red algae, sea vases, and several varieties of tunicates. In practice, invertebrate fouling was far heavier and harder to remove than algal fouling. 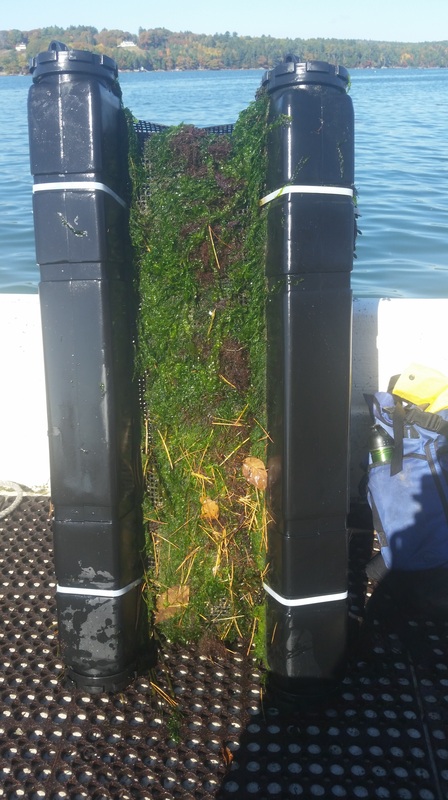 Control cages fouled as expected, with algal colonization on sun-facing submerged surfaces (see fouling charts). Though the surface area fouled with algae sometimes surpassed that seen on the pivoting cages, the relative absence of invertebrates on the control cages made them much lighter and easier to handle than the pivot-cages, and likely contributed to faster observed growth rates. By the end of the experimental trial there were significant differences between treatments for each growth metric measured. The control cages produced the largest oysters (measured by shell length, shell width, shell depth, and total volume of oysters/cage). The barrel-cages had by far the smallest oysters, with an average length nearly a full centimeter smaller than the control. The pivot cages produced oysters that fell in-between the other treatments. There were no clear trends in mortality through the trial, with standard error exceeding the difference between treatments in most months. The slow poor growth seen in the barrel cages may be due to the crowding the oysters faced due to the concave surface they rested on. Unlike the experimental designs, control cages required manual flipping each week. The process requires farm visits on back-to-back days, and is slowed by poor weather conditions and high seas. 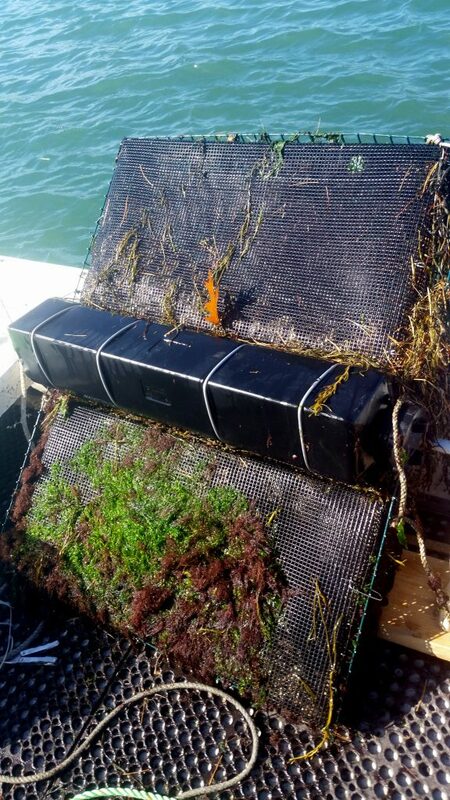 During each monthly measurement period, these cages required manual cleaning on their top panel which primarily picked up filamentous green and red macroalgae. This fouling was easy to remove and was much lighter than the invertebrate-fouling seen on the pivot cages. The control treatment largely avoided infestations of the worst fouling pests- sea vases and tunicates. Barrel cages required no manual cleaning during monthly measurement periods ( the only treatment where this was the case). The cage-closure was much more time consuming than the other treatments though but this was a factor to how they were built and not an inherent consequence of a rotating design). Pivot cages took by far the longest to clean/defoul. The fouling organisms they attracted were both heaviest and hardest to clean (sea vases and tunicates). Pest management took up to 5 times longer compared to the control (~15 min vs 3 min per cage). The pivot cages proved very unwieldy and difficult to work with in the field. A project overview and preliminary data were presented at the Kennebec Estuary Land Trust’s lecture series (Aquaculture Night) to a crowd of around 40. Over 250 unique users have visited the research-project related pages/posts on the Winnegance Oyster website. Final data was presented during poster sessions at the 2017 Northeast Aquaculture Conference and Exhibition on Jan. 12 in Providence, RI. During the poster presentations 43 attendees actively engaged with the researcher (project explained verbally). An additional 120+ individuals passively engaged (stopped to read poster). 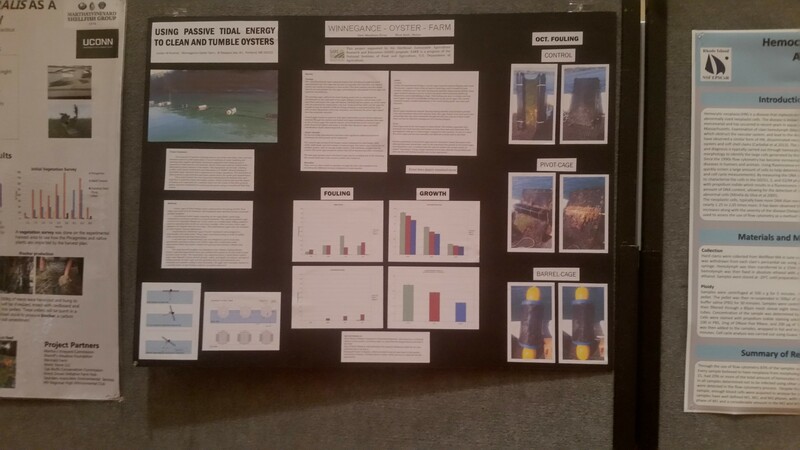 This project was a useful step in proving the feasibility of oyster cages that use tidal and wave action to control fouling in subtidal oyster farms. Though the balance of the “pivot” design was too fickle and and pivot cages were too unwieldy to be practical, the “barrel” design was low-maintenance and extremely effective at preventing fouling. Though oyster growth rates in the barrel design were slower than the control, the labor trade-off could make this design attractive- especially to larger farming operations. For smaller, more intensive farms (like Winnegance Oyster Farm) that rely on fast-growth/quick-turn-around, this iteration of the design may not yet be economically viable. If further refinement of the barrel design could match the growth rates seen in the control group, I believe widespread adoption is possible- with great labor-savings to farmers.